The tmnt summer shorts have returned, only this time being called just tmnt shorts. Daddy issues?? Callin' Leo out like that... How rude. The ice cream was the best part. 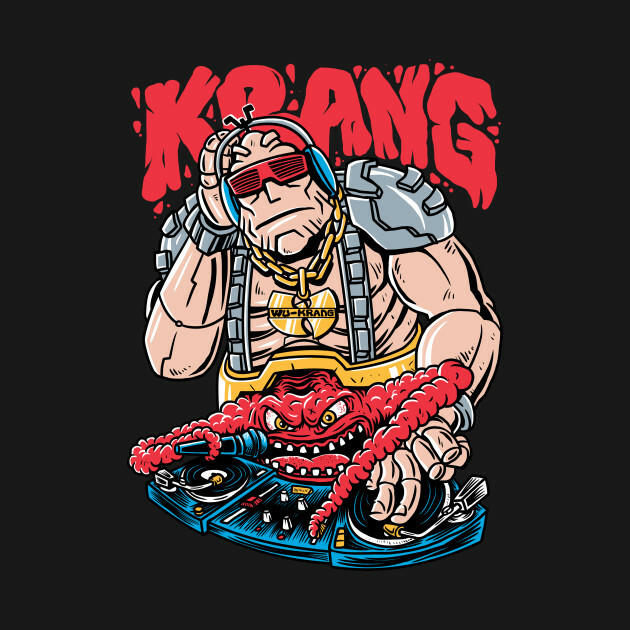 Gangsta Krang singing rap like he was "in da hood" with the "bling bling" and the gold necklace on his Android body was my favorite part. And the Android had his chin lifted up to the left like he was "Old school" or whatever they call that notion. Dayum, son, just damn son homie dawg. Also whoever does Rocksteady's voice in these sounds nearly identical to Cam Clarke's Rocksteady. I mean damn, it sounds almost the same. Another "Team-Up" short? Seriously? Why are there so many of these? Anyway, is the "Pancake in Bellybutton" an actual character from something? It seems like he would be. All seriousness, why more of these are coming out is beyond me. Is it a shoestring budget compared to the other ones? I'd much rather have seen a new short with a different style because after you see one, you've seen them all. Nah, the Pancake guy is a reference to a guy who went up to a reporter, took her mic a screamed "f*ck her right in the p*ssy". Kind of an odd reference if you ask me. Here's the video if you want to see for yourself. You guys realize all these shorts were likely produced at the same time, right? They probably ordered like 10 of these TMNT team up shorts at once and they're releasing them one by one. It won't be anything like these shorts. Most likely these shorts were a pitch for a new show that got turned down, thankfully. Raise your arms in the air like you just don't care! Is this your way of dealing with grief? Hey I'd love to be proven wrong but the closer we get the tighter my gut gets, like a wise guy once said, "I have a bad feeling about this"
Really wish they'd have a bit more variety with these shorts. Especially since the reaction to the Team Up ones is almost always negative. I found the "Team Up" ones entertaining (even chuckled a few times), but I can only watch them a few times before I say enough is enough. There are only three shorts in general that I really cared for in this bunch. 1. "Turtles take Time (and Space)" - I wouldn't mind at ALL if the new series had designs similar to this for the Turtles. 2. "Teenage Mutant Mecha Turtles"
3. "Pizza Friday" - this one only makes the list because I liked the concept of the guys being human for a short time. The overall story was kinda "meh". Leo's obsession with his fingers was pretty funny, though. Last edited by Kit31; 10-04-2017 at 03:35 AM. If only others, such as the 'We Strike Hard' short, go more... *sigh* Still one of the better ones, even if still not quite what I'd want in a series. At this point, probably the idea is to immerse people in this so entirely that when we do see the actual "Rise of the TMNT" stuff, "Rise" will look like "The Godfather" by comparison. I really hope that's not the case. Anyway, including the CC one, this is the sixth one, correct? I'm still perplexed as to why we got so many, were they just comparatively cheap to make? Hate to say it, but it had crossed my mind. Saturate us with this so the next series will look great? Hope not. Hope it actually turns out okay and doesn't need other things to make it look that way.